tallgrass prairie studio: House Work Trumps Sewing? Finished blocks 7 and 8 of AmandaJean's Seeing Stars Quilt-a-long. I love the fabrics in these stars. I have 6 of the setting blocks done too, but I'm not sure I want to use them. I have all 8 of the stars on my design wall and I'm really digging them all together. I'm considering making additional stars instead of using the setting blocks. Still noodling on that one! I got mail this week. In the package was Melissa's fabric for the second month of the Common Threads virtual quilting bee. I adore her fabric choices, a beautiful Alexander Henry print and 4 coordinating solids. You can see her inspiration quilts here. I think she's wanting some curved piecing in this block. Another challenge for me. We're out in the country for the weekend. I brought some projects since I'm committed to Peg's finishing challenge. I hope to get at least this quilt quilted. I have my pinwheels with me and the cut fabric for Hannah's graduation quilt. I don't know if I'll have time to sew much...I've got weeding, mowing, a room to paint, a ceiling in another room to paint, windows to paint and an ant invasion to deal with...sounds like it might be a painting weekend rather than a sewing weekend. It's hard to let working on the house trump sewing, but I've been putting this off for too long. We'll see what happens, kind of depends on my mood tomorrow. Have a great weekend everyone! I love the stars. They do look wonderful together. Your stars look great -- love the fabrics you chose. Your stars turned out great! Can't wait to see what you end up making for Melissa with her fabric. Good luck on all your projects this weekend! I love your stars - they look fantastic!! Housework also has to trump sewing here - at least for the morning - we'll see how far I get - haha. Oh I love your stars! Makes me want to start over again with your color choices! This is going to be a gorgeous quilt! i love your stars. i'm so inspired to do something with white blue and green like that! great fabric choices. I love star blocks. I like them like this too. You could always make 2 quilts, one with setting blocks and one without. Why not just start making more blocks and see what happens. Your star blocks look great! These are beautiful! I love how your fabric is coming together. Good luck with your weekend chores. You are brave with your stars...am not confident with triangles myself! There is one design in my inspiration book though of patterned stars and alternate large patterned blocks so must try that. Looking forward to what you do with yours! I can't wait to see what you do with Melissa's fabric. Your quilt-a-long pieces are looking great! I have yet to gain momentum again after the trip. Good luck with the house! I love your fabric selections and your stars! They look great together. Housework trumps here too (my step-daughter and BF are coming to town this week - REALLY gotta clean!) And yes, Kris is older! Love the colors in your star quilt. I only have 3 blocks done so far. I better get busy. Guess who is getting tulips? hope you get at least a bit of time to sew this weekend! your stars are so wonderful. When you finish, I have a few rooms that need painting. I'll be happy to sew while you paint. No? Then I vote for sewing and hiring a handyman! i do love your colors in these blocks. they all look super!! sounds like a busy weekend, i hope you can squeeze a little bit of sewing in some time. I hate it that housework always trumps sewing. I like the idea of all the stars. Ants seem to come in here in my place through the plumbing, so I leave some cleanser sprinkled in the sink, and that works for me. Plus some spray on the baseboards, etc. Oh my stars! Just lovely. What are you going to do with the bird fabric? Can't wait to see. P.S. Do some sewing anyway. Big decisions,hope you managed to fit some sewing in between the painting! great stars! I can hardly wait to see what you do with the fabric!!! The stars are gorgeous. Don't you just love to see something you've been working on come together so nicely? Have a wonderful weekend. I love to paint rooms too, so that would be a toss up for me. I am amazed at the variety of designs in your stars. The colours are great. the stars are beautiful. I have a living room half-painted that I keep swear I'm going to spend the weekend on..... somehow, I still haven't gotten it done. I LOVE your stars! Great colors. Just wanted to say thank you for being the first person to comment on my brand new blog. Thanks again!!! Can you help me a little? How did you get your blog header to look so nice? Would love something that size on my blog. I love your stars! I think I might have to belatedly start the quilt along - you've inspired me! 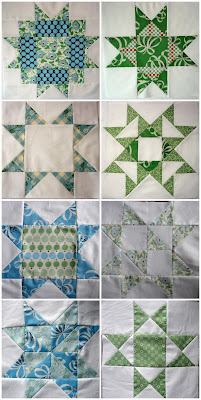 When I see really crisp and lovely green/white, turquoise/white blocks I begin to think that blue/white is over-rated. Your blocks are refreshing and cool (like a stream). Very nice.